I have seen Avatar twice at the cinema, both times in 3D. The first time I found the 3D distracting, probably because I am not used to it. True, the three-dimensional effect is not ‘in-your-face;’ it is used to enhance the movie and create greater immersion, a feeling of ‘being there;’ however there are a few scenes with soldiers milling about and I had to keep checking that this was part of the film and not people walking around the cinema itself! Yes, the 3D is that good! It makes you believe you can reach out and touch things (the illusion only ruined when you try)! The CGI is groundbreaking in itself; the alien race, the Na’vi, are so convincing, so realistic, the only way to tell them apart from real people is… they’re blue. Likewise the terrain, plants and animals that make up the planet of Pandora are breathtakingly realistic. You could not do better if you dropped a man off on an alien world with a video-camera. On my second viewing I knew what to expect enough that I concentrated on the story more, enough to conclude that, nice as 3D is, this film could stand without it. The plot, though not groundbreaking, is solid and believable. It borrows from history and projects into the future. You may recognise similarities to ‘Dances with Wolves’ ‘Fern Gully‘ and ‘Pocahontas.’* You have the technologically advanced invaders versus the tribal natives who are at one with nature, and the outsider who is seduced by their culture. If it’s a rehash then it is a rehash of a good story with enough originality injected in to make it fresh. The acting is superb and even outshines the special effects. The characters are easy to empathise with, their reactions believable. When Neytiri (played by Zoe Saldana) laughs or cries you know why and can feel it with her. The supporting cast is also strong and I even found Colonel Quaritch likable. In conclusion Avatar is an expertly crafted movie with no expense spared and every attention to detail put in. It’s quite the experience and worth watching. 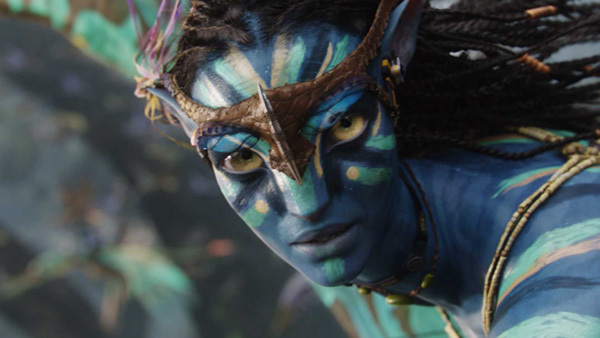 Avatar is a milestone in movie-making and sure to be a trendsetter for many years. *The links head off to spoof trailers – very funny.